Volunteers expected to find storm damage at Harbor of Refuge after Delaware's violent nor'easter on May 11 and 12. But they weren't prepared for what they saw early Saturday morning. Everything that had been accomplished on May 3 -- and more -- was wiped out. 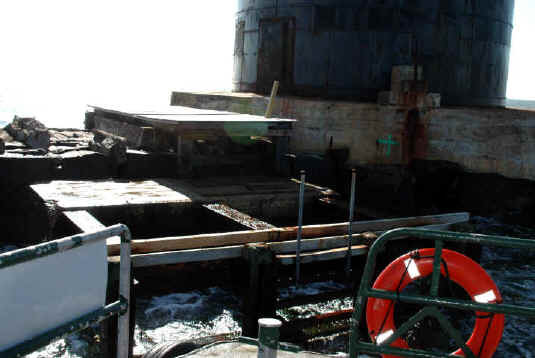 Last year's new deck -- which had just been reinstalled after spending the winter safely inside the lighthouse -- had been ripped from the iron girders and washed out to sea. All of the sturdy wooden foundation laid on the girders was gone. Planks were torn from the upper deck. Safety railings were missing. Steps were nowhere to be found. Beneath one end of the upper deck where several large breakwater stones had supported the iron frame, there was only a gaping void. Erosion of the breakwater from under the south side of the lighthouse didn't appear to be much worse. But the black hole of missing stones under the north side had grown. And as the launch approached the lighthouse in choppy seas at high tide, workers could see that the ocean has finally cut a crooked route through the top row of capstones on the breakwater wall. 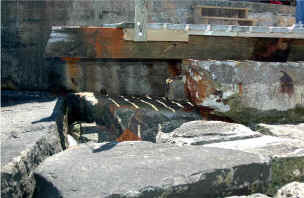 The section where breakwater stones have been washed out from under the lighthouse collar on the north side of the structure is growing at a frightening pace. Supporting stones are now totally gone from under a two-foot section of the iron frame for the upper deck. Deeply discouraged, but not defeated, nine volunteers set to work. In the short time available, emergency repairs had to be made and the lighthouse had to be readied once again for the tour season that begins May 31. Fortunately, the Foundation had ordered a spare section of the composite decking last year. Insurance against just such an occasion as this. And now that the spare is in use, another will be ordered. Plans had called for all of Saturday's volunteer efforts to be focused on paint removal in the Watch Room and the Gallery Level. Instead, the strongest half of the crew had to be diverted to hard labor on the outside of the light. Fortunately all of them -- John Gordon, Mark Lizzi, Red Moulinier and Jerry Perrin -- were old hands at building docks and repairing decks. Inside, three members from Maryland -- Paula and Lauren Liebrecht and Sandra Sableski -- along with Ruth Africa and Judith Roales took on other tasks, including some paint removal. 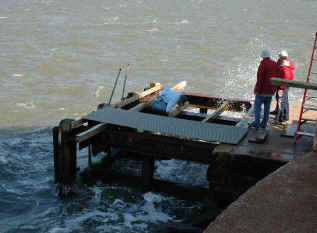 Volunteers braved choppy seas and cold ocean spray to make emergency repairs that allowed for the installation of yet another landing deck on the lower dock. Ready again. It was, volunteers recollected, the eighth time the lower dock has been replaced. 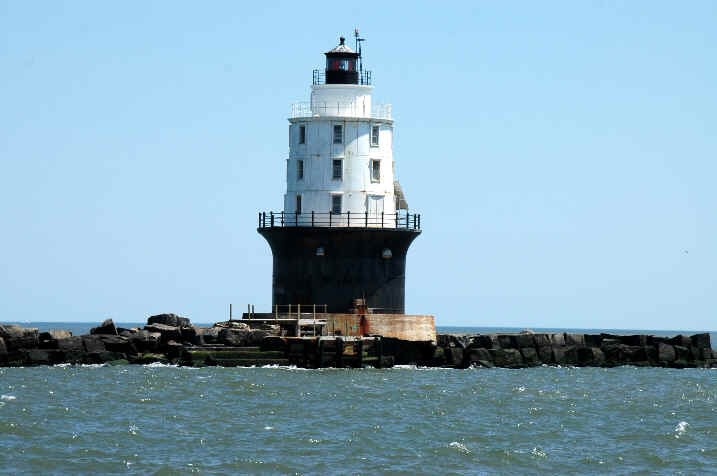 Delaware Breakwater East End Lighthouse fared well during the nor'easter of May 11-12. 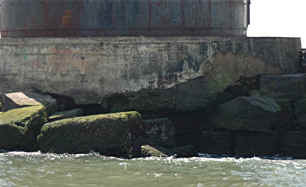 Sitting on the less exposed inner breakwater, East End lighthouse was undamaged. Not even a new broken window.